Tuesday, Nov. 3, 2009 at 9:35 p.m.
President Barack Obama made three campaign trips to the Garden State to stump for Governor Corzine. So did he have any impact on the vote? Well, he probably didn’t change many New Jerseyans’ vote choice, according to the exit poll. While 19% of voters say that one of the reasons for their gubernatorial vote was to express support for Obama, a similar 19% said that opposition to Obama was among the reasons they made their vote choice. 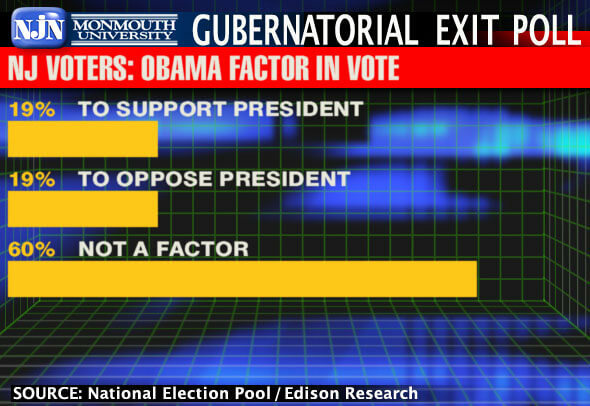 Another 60% said that Obama was not a factor in their choice for governor. Among those who said the president did not figure into their vote choice, 48% went for Chris Christie, 44% went for Jon Corzine, and 8% voted for Chris Daggett. The President earns a 57% approve to 42% disapprove job performance rating. Among those who approve of how Obama has been handling his job, 73% supported Democrat Corzine and 19% voted for Republican Christie. Among those who disapprove of the president’s job performance, 89% supported Christie and just 7% cast their vote for Corzine. “Barack Obama’s biggest impact on the New Jersey race may not be captured in the exit poll. Apparently he did not get enough die-hard Democrats out to vote who didn’t want to support Jon Corzine,” said Patrick Murray, director of the Monmouth University Polling Institute and exit polling analyst for NJN News and Gannett New Jersey. Therefore, if I didn't count this one wrong, the only real effect that Obama had on the elections was that he made 38% of the voters actually vote. Well, that's a good thing, in the end, isn't it? Not quite Julie. The exit poll question was whether Obama was "one reason" for your vote, not THE reason. It could have been only a secondary reason. In which case, the fact that Obama was not even AMONG the reasons for 60% tells me this election wasn't about the president at all.